This study introduces a new business philosophy that offers companies hope for a competitive future. Hammer and Champy examine the overall nature of work and ask the question Why do we do what we do at all? If a company isn't performing, rather than tinkering with it, they redesign the corporation and its work methods from top to bottom, an approach that is saving one Fortune 500 company USD 100 million a year. 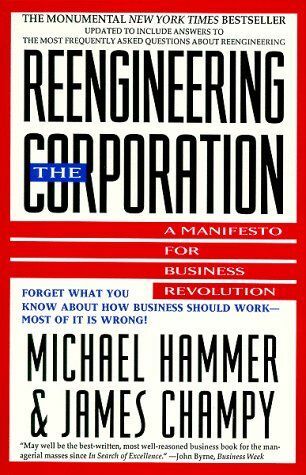 Based on their consulting for the top corporations in the world, the authors have been able to differentiate patterns of action that work from those that don't, and have created an approach that managers and CEO's can use to reengineer their own companies, including a vision of what a reengineered corporation looks like, how to bring about the reengineering, insights into managing in a reengineered company and how to handle the transition. Throughout the book are examples of companies that have used reengineering to recreate themselves, such as Tace Bell, Bell Atlantic and Hallmark Cards.